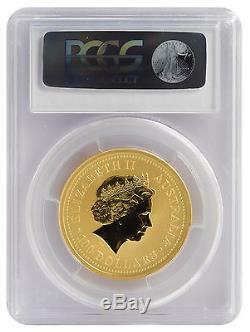 This 2003 1oz Gold Australian Lunar Goat is graded MS70 by PCGS. The Australian Gold Lunar Series 1 began in 1996 with the Year of the Mouse coins and ended in 2007 with the Year of the Pig coins. The Goat is the eighth release of the Series I 12-coin Lunar series. There were only 16,775 coins minted. Australian legal tender, the Australian Gold Lunar Series 1 coins are among some of the most beautifully designed coins in the world. 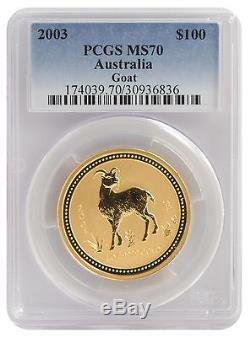 The item "2003 1oz Gold Australian Lunar Goat Series I MS70 PCGS (#836)" is in sale since Sunday, November 20, 2016. This item is in the category "Coins & Paper Money\Coins\ World\Australia & Oceania\Australia\Gold". The seller is "baypreciousmetals" and is located in Bridgewater, Massachusetts. This item can be shipped to United States.